Cloaked in black, Richard Mille’s new RM 032 DARK DIVER Automatic Chronograph is dressed for the depths of the sea. Like the original RM 032 Automatic Chronograph, this limited edition is water-resistant to 300 meters (30 atmospheres) following ISO 6425 diver’s watch norms. That degree of water-resistance is particularly difficult to achieve with a chronograph, since water pressure on the pushers and crown could be powerful enough to unintentionally start the chronograph. In order to avoid any external pressure effect or accidental manipulation, Richard Mille has developed a locking crown for the RM 032 that secures the pushers and as a result ensures perfect water resistance. The crown and its pushers can be locked by simply rotating its ring. The 50-mm tripartite titanium case is curved for ergonomic comfort, a hallmark of all Richard Mille models. Its dramatic dark look is achieved with a DLC treatment on the case and buckle, plus black bezel indicators, pushers and rubber strap. Superluminova elements on the running indicator disc, hands and hour markers allow maximum visibility during any undersea adventure. Only 30 pieces of the new RM 032 DARK DIVER Automatic Chronograph will be made. 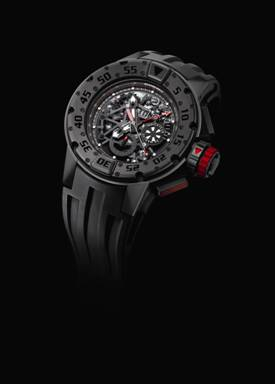 The limited edition will be sold at the Richard Mille Boutique Beverly Hills, California.